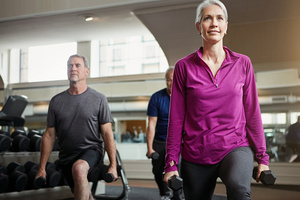 New Milford Hospital is hosting fitness classes for middle-aged and older men and women to increase strength, balance, and flexibility. Strong People Strong Bones is a nationally recognized fitness program designed to prevent and reverse osteoporosis and osteopenia and promote general health and wellness. Classes are open to the community. For more information, contact Lisa Lee, Strong People Strong Bones Leader from New Milford Hospital, at 860-614-1737. This class is open to Senior Center members and the community. For more information, contact Ellen Melville, Brookfield Senior Center Director, at 203-775-5308 or Lisa Lee, Strong People Strong Bones Leader from New Milford Hospital, at 860-614-1737. The Strong People Strong Bones Program was developed by Miriam Nelson, Ph.D., associate professor at the Gerald J. and Dorothy R. Friedman School of Nutrition Science and Policy at Tufts University. The program is based upon years of research on how strength training and nutrition improve the health of men and women of all ages. “Strength is a critical factor in living healthier, more active lives. Our research shows that a program of strength training not only improves bone density but reduces falls, improves arthritis symptoms and increases flexibility and strength,” said Dr. Nelson. This program is designed to increase strength, balance, and flexibility, and is appropriate for both sedentary and very active people. Classes are led by Lisa Marie Lee, an instructor who was certified to teach the program by Dr. Nelson, its founder.